One of the winning features of this new technology is that it is self-charging, both by day light and artificial light, and holds its charge up to 8 hours. Therefore it requires no power source or maintenance, can be washed as normal without any special conditions, works on demand of the working environment. 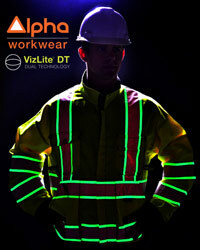 The new Dual Technology has all these advantages over electro photo luminescent products and at a fraction of the cost. 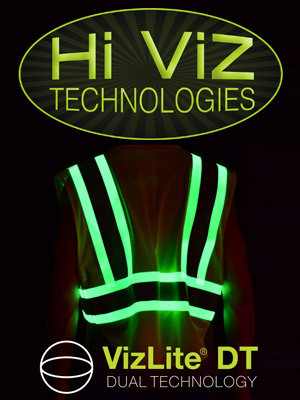 Viz Reflectives believes that the current technology of reflective tape needed to evolve to meet the new challenges of our ever changing working environments. 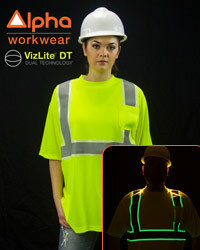 For there are many scenarios in the day time when workers are exposed to low light conditions such has working in large warehouses where in some case the light is low or the workers are moving around in areas where the light is shaded by obstacles.